Campbell Scientific recently added several improvements to our EC155 Closed-Path CO2/H2O Gas Analyzer and CSAT3A 3D Sonic Anemometer. The EC155 with the CSAT3A anemometer simultaneously measures absolute carbon dioxide and water vapor mixing ratio, sample cell temperature and pressure, and three-dimensional wind speed and sonic air temperature. 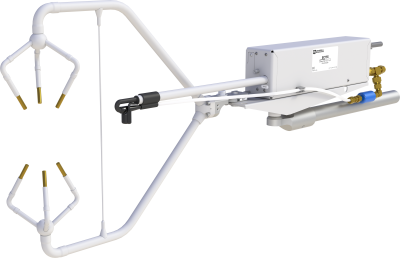 The EC155 and CSAT3A are components of our CPEC200 Closed-Path Eddy-Covariance System, which also includes the sample pump, datalogger, optional valve module, and optional scrub module to provide a zero-air source. The newly designed EC155 incorporates vortex technology for reduced maintenance, an absolute pressure sensor in the sample cell for more accurate measurements, and a sample cell with improved corrosion protection. The revised CSAT3A has a more aerodynamic and rigid design for better sonic temperature measurements and more streamlined mounting. The patented vortex technology is a significant advancement in flux measurements. It reduces maintenance by supplying clean sample gas to the analyzer sample cell. The process pulls ambient air through a rain diverter intake and into the vortex. The vortex flow swirls the denser particles to the outside of the cone and out through the bypass flow. The particles are then collected downstream in a large filter. Clean air is drawn from the center of the vortex and delivered to the sample cell. These views of the vortex intake show how particles are separated and clean air is pulled from the center of the vortex and allowed to continue on to the sample cell. 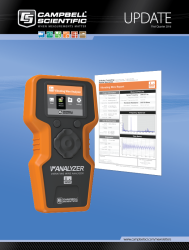 Campbell Scientific continues to be highly enthused and engaged with our customers measuring fluxes. We hope these recent advances will propel efforts to understand the interactions between biogeochemical processes, climate change, and ecosystem science.